Daniel Carroll II was the son of Daniel Carroll and Eleanor Darnall. Born in 1730 to a prominent colonial family in Upper Marlboro, Maryland, Daniel signed both the Articles of Confederation and the Constitution. He believed in a strong central government and election of the president by the people, not the legislature. Daniel was also one of the three Federal Commissioners for the District of Columbia. He married Eleanor Carroll, a second cousin, about 1752. Archbishop John Carroll was Daniel's younger brother. Ann Carroll, one of his sisters, is my ancestor. A memorial to Daniel Carroll II was erected by three NSDAR chapters in the St. John the Evangelist parish cemetery known also as the Carroll Chapel Cemetery. In a biography of Daniel Carroll II, the author, Sister M. Virgina Geiger, notes that it has never been proven that he was buried in this cemetery with many others of his family. She feels that is more plausible that he was buried in the courtyard of the Holy Trinity Convent in Georgetown. The convent referred to was the Chapel of St. Ignatius, the original Holy Trinity Church founded by Archbishop John Carroll, Daniel's brother, in 1794. In the mid-1800s a new Holy Trinity Church was built and the original church became the Chapel of St. Ignatius. It was used for a time as the Convent of Mercy for the nuns who taught at the parish school but in 1999 was converted back to a chapel. 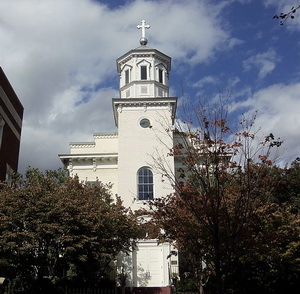 This original Holy Trinity Church is the oldest Catholic Church in the District of Columbia. The archbishop, Daniel's brother John, outlived Daniel by nearly twenty years. Daniel's actual place of burial probably cannot be confirmed, but, thanks to the NSDAR, he has been given a memorial in the cemetery. 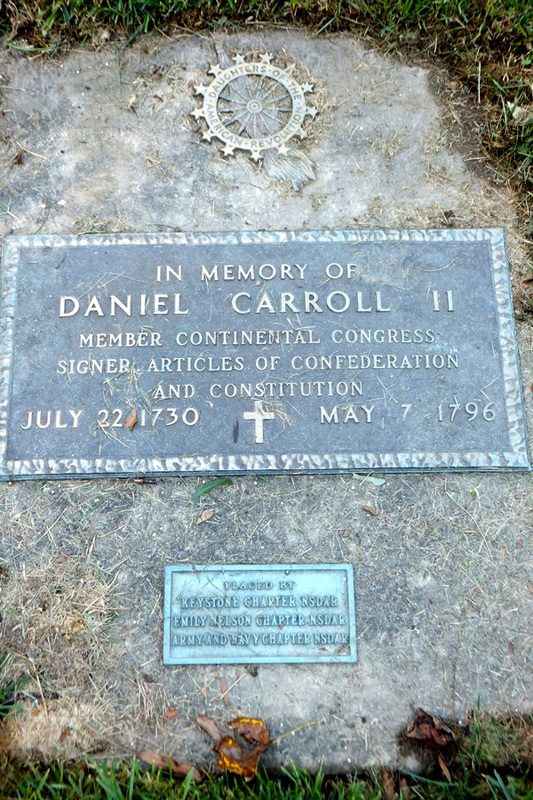 Photograph of Daniel Carroll II's memorial in Forest Glen, Maryland, was shared by Richard Dalrymple who visited the cemetery in 2012. The photograph of the Chapel of St. Ignatius is from Wikimedia Commons, taken by "Farragutful" and shared under the Creative Commons license, has been cropped slightly. More information on the Chapel can be found at Glover Park History, Catholic Burial Grounds of Georgetown.